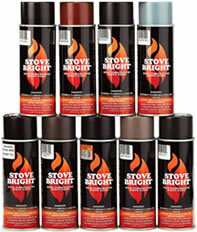 Stove Bright® offers a full line of premier cleaning products for use with your heating stove and BBQ. These products are designed to clean soot and creosote off glass and masonry, remove whiting off the glass and logs of a gas unit, remove baked-on residues from your BBQ grill, or simply prepare a surface for painting. This diverse mix of products has proven to be the perfect partner to our High Temperature Paint line. 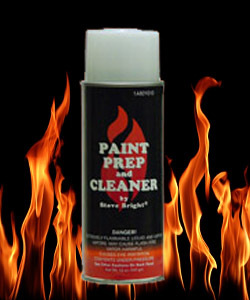 Stove Bright® Paint Prep and Cleaner is a premier cleaner and degreaser that is specially formulated for cleaning metal surfaces before painting. It has a pleasant citrus smell making it acceptable for indoor use. Perfect for cleaning and preparing almost any metal surface for painting such as stoves, stove pipes, chimneys and caps. Paint Prep is available in 12oz aerosol cans making it the perfect size for any job. Paint Prep can be used to prepare metals before painting with all Forrest Paint Aerosol Products. 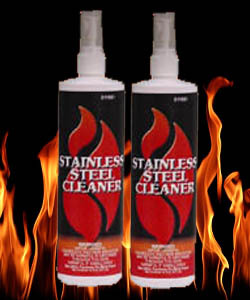 Stove Bright® Stainless Steel Cleaner is a special “no streak” formula that works like magic to remove dirt, grease and grime from many metal surfaces. It cleans stainless steel, porcelain, ceramic, chrome, and aluminum providing maximum results with minimal effort. Use Stove Bright® Stainless Steel Cleaner to bring new life to stainless steel barbeques, refrigerators, toasters and other appliances. 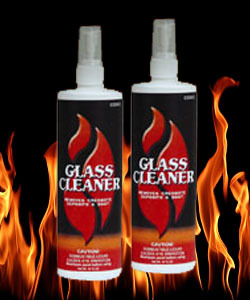 Stove Bright® Glass Cleaner* is a concentrated liquid that is specially formulated to cut through baked on carbon and creosote deposits found on tempered glass, porcelain, and baked-on enamel. It contains a non-streaking formula which removes layers of smoke stains with ease from your wood, coal, and pellet burning stoves.